This is the fifth movie in the Pokemon Anime! It is going to be released released May 16th of 2003 by Miramax (a Disney Company) which means it is a limited release. 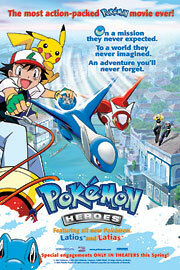 The basic plot of the movie is that Latias and Latios protect a city and the famed jewel of the city called the Soul Dew, but two Team Rocket Members steal it. Their names are Annie and Oakley. The Soul Dew has amazing powers that only few people understand, and has the power to even destroy the Earth. This means that Ash and company have to save the world and Latios from the evil powers of Team Rocket once again! To the left you can see the American movie poster for Pokemon Heroes, and to the right you can see the Japanese movie poster.